The PADI Divemaster Certification is a very prestigious certification and the first step to becoming a diving professional within the recreational ranks. It is designed to give those divers who wish to work in the industry or lead club/social dives the knowledge, skills and experience to supervise all phases of diving activity in a safe and professional manner. The PADI Divemaster must display strong physical skills, fitness, ability and proper attitude to safely organise and conduct dives. 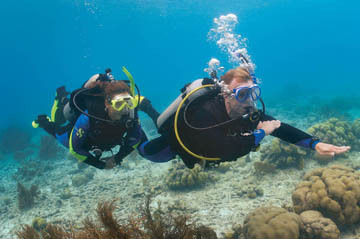 PRE-REQUISITES: PADI Advanced Open Water Diver or equivalent and PADI Rescue Diver or equivalent. You also need to be a minimum age of 18 by the start of the course. A diving medical must be submitted no older than 12 months. Candidates must also provide all of their own diving equipment including an emergency signalling device (ie. whistle), knife etc. You must have completed and logged at least 20 dives in open water and proof of CPR training within the last 2 years. COURSE OUTLINE: The Course is run over approx. 3 weeks, breaking up the 8 academic topics and two afternoons of pool training. The classroom topics covered are. The above exercises must be completed within certain time frames. A group Open Water map making exercise is also necessary at a given local site. Once academic and pool training exercises are complete the student must complete an internship, working with REAL students in training under the supervision of the Course Instructor for 5 separate pool sessions and 6 separate open water sessions. COURSE FEE: The PADI Divemaster Programme requires an investment of $1095 per student. A $300 deposit will secure your place in the Course, with the balance payable on the registration evening. INCLUDED IN THE COURSE: Certification Costs, Air Fills (in Adelaide), Instructor Fees, Pool time, PADI Divemaster Manual, Diving Knowledge Workbook, Encyclopaedia of Recreational Diving, Recreational Dive Planner, ERDPml, Divemaster Application Package, Padi Membership, 2 internship Boat Dives, Personal ID Card. We at Divers Service strive to show you nature at its best. Come and learn to dive with us and be part of a unique team that offers all of the above and more!